All of nature is envious of Emerald’s green. Quite literally the most beautiful green color in the world is found in Emeralds. The May birthstone is one of the four precious gemstones and was traditionally highly sought after because it was thought to bring its wearer material wealth. Anyone who is a public speaker or makes lots of presentations should wear Emeralds, as they are believed to help bolster effective communication. 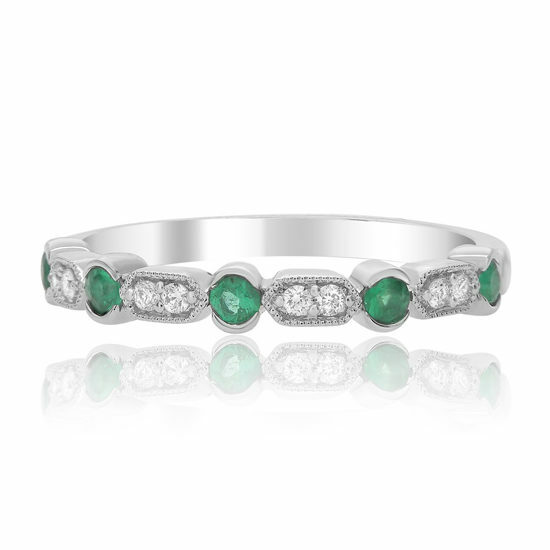 This 14k white gold ring contains 0.19 carats of carefully matched green Emeralds and 0.08 carats of round diamond accents set in a milgrain edged band.